A photo from the ongoing excavations at Yumuktepe Mound. 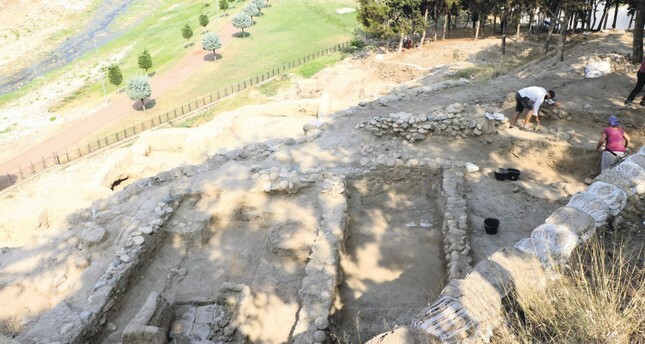 A team of 25 archaeologists recently kicked off seasonal excavations at the Yumuktepe Mound, a historical site in southern Turkey's Mersin, dating back to the 7,000 B.C. Located in the central district of Toroslar, the mound is regarded as one of the oldest settlements in entire Anatolia. The excavation team will be led by renowned archaeologist professor Isabella Caneva from Italy's Lecce University. Excavations at the site began after two days of cleaning works and will continue for two months. Caneva said that her team will focus on the different layers from different periods. She said that Yumuktepe is a well-known site and added: "Yumuktepe is an ancient settlement. It has been occupied for a long time. There has been mobility here since the 7,000 B.C. Its population only decreased in the Roman period. The mound was small for them. They wanted luxurious residents. However, there are not only traces of the Roman period but also from the Early Neolithic, Early Chalcolithic, Early Bronze and Iron Ages. You can see their remains here." Excavations work at the site have been going on for nearly 25 years. Caneva said that they have used a different kind of excavation technique here, helping them develop newer concepts of archaeological works. She said that they would only search for buildings and remains. "Now, we are also looking for animal bones, leftovers and seeds. They are simple things, but they tell a lot much about the economy of those periods," she said. Caneva noted that they have prepared an open-air museum project for the area. She added that they were working together with architects from Mersin University.